​ German blood lined AKC Rottweiler Puppies since 1997!! Your Rottweiler will be your canine soul mate. You will need to choose your new family member carefully to find just the right traits and temperament. This is first in our minds as we carefully select our breeding's to produce the very best in this noble and magnificent breed. Puppies should be born in the first week of May 2019. You can click on the word pedigree for the link. 2 sets of shots before going home. We have been a professional breeder in the Phoenix and Casa Grande area since 1997. We specialize in the family friendly Rottweiler. Though each of our puppies have International Champions in their pedigree, our goal is not to produce show dogs, but to create the very best CHILD FRIENDLY ROTTWEILER to help improve the reputation of this beautiful breed. Our puppies are very well socialized by myself, family and visitors we have over. Early socialization is very important in producing the kind of temperament we desire. Large kennels that have more than 20 dogs, and more than 3 litters at a time do not have the time to provide adequate socialization. Puppy "imprinting" is achieved in the first 14 weeks of life. Our daily socialization time ensures you that your pup is well on his or her way to have an exceptionally friendly personality. Rottweilers are naturally protective of their home and family. This trait does not need to be encouraged in breeding. 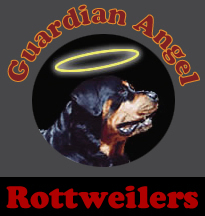 I purchased a male Rottweiler from Guardian angel Rott’s. The puppy was born first week in February 2016, we were lucky to get him a few days earlier than expected since we had to travel some distance to get him. We had the best experience with Becky and she truly knows how to produce beautiful, kind and loving Rotties. I said after our last female Rottie passed away in 2003 I would never get another Rottie because it would remind me of her but my son and husband ran across Becky’s website and once I saw the puppies I was hooked. I spoke to Becky numerous times( she was so patient with me) and put a deposit down , dealing with her has been nothing short of fantastic and I try to send her pictures as our little man grows. I would absolutely recommend Becky and her puppies to anyone just look on her past puppy pics and you will see several of our Kade Ruger on there! We are so thankful to have found Becky and Guardian Angel Rottweilers!!! We researched different breeders and rescue facilities for quite sometime. A friend stumbled across Guardian Angel Rottweilers website. After investigating (reviews, questioning friends that work with rescues and such) we couldn't find any negativity surrounding them. We emailed Becky and found out she had puppies available. We inquired about a brother and sister. First question we got in return was "your not going to breed them right"? As strange as the question sounded it really put us at ease with her as she truly seemed to care about the dogs futures. Once we explained we wanted them to grow up together and breeding them was never going to happen she agreed to send us photos. We fell in love!! We saw pictures of not only the pups but mom and dad as well. Also we got information of the parents lineage. Very impressive to say the least. We put down the deposit as they were not ready to go yet. She showed us AKC papers and first shot records. She had already had their tails and dew claws done as well. Soon we were able to pick our new fur babies and bring them home (or should I say they picked us). Our family is complete and we couldn't be happier with our choice to go through Becky and GUARDIAN ANGEL ROTTWEILERS!!! Hanzel and Gretyl are gifts of love and we highly recommend Becky as she is not only a true professional but a very very caring breeder. night without him by myside. He is my true love! Everything about him I love. He is special and unique. You called him Thor. I named him “Kota” it means Happiness and Good Fortune. And since his mom and dads names both started with a K and so does mine it just goes perfectly with him and what he means to me. So I cannot thank you enough for giving me such a blessing. I would highly recommend you to anyone looking for that perfect family member and in the future when I’m ready I know where I’ll be going for my next dog! Guardian Angel Rottweilers is hands down the best there is!